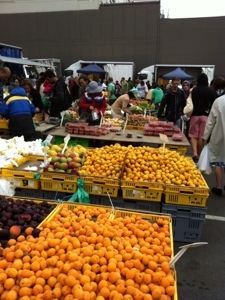 on a grey and blustery day, the fruit and veg market on Ghuznee street is a feast of colour and sound. Every Saturday in Newtown and Sundays here in Te Aro, the markets provide basic groceries to thousands of Wellingtonians.. They’re one of my favourite parts of living here. This entry was posted in Places and people and tagged Wellington. Bookmark the permalink.